Only one Regional Rodeo Qualifier event remains in the 2012 Crane Operator Rodeo, conducted by Crane Institute Certification (CIC) and organized by MCM Events. In September, crane operators competed in crane safety and skills competitions created by CIC Practical Examiners in Houston, Texas, Wilmington, Ill., and Phoenix, Ariz. The last Regional Rodeo Qualifier will take place in mid-October before the top performers from all regional events will meet on Oct. 27-28 for the National Crane Operator Championship in Davenport, Fla.
“Through our participation as the Event Partner in the Crane Operator Rodeo, we hope to increase awareness of the pending 2014 requirements for crane operators to be certified by crane type and capacity,” said Debbie Dickinson, executive director of CIC. “Since CIC Committees reviewed C-DAC language in 2008, the CIC Governing & Advisory Committees have worked toward providing the most affordable certifications that are realistic for the workplace. Certifications from CIC are in accordance with 29 CFR 1926.1427,” said Dickinson. The Crane Operator Rodeo underscores the need for appropriate operator skill levels to achieve safe crane operation. 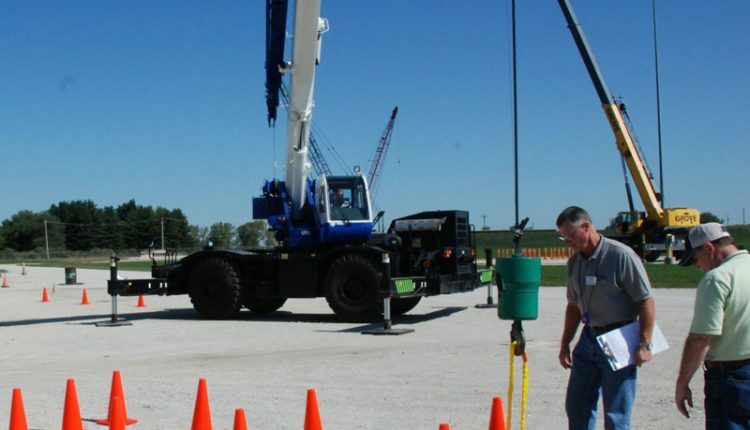 As the Event Partner of the Crane Operator Rodeo, CIC designed and oversaw the competition standards, set up the courses, and provided practical examiners as judges. The three Rodeo challenges included the Barrel Dunk, Barrel Weave, and The Pipe. In the Barrel Dunk, operators are tasked with dropping the crane’s headache ball into the barrel without moving the barrel outside of a perimeter or knocking the barrel over. During the Barrel Weave, operators maneuver a load, which is dragging a chain, through a slalom course without lifting the chain off the ground or knocking over any barrels. The Pipe event requires the operator to upright a pipe within a narrow perimeter and lay it back down again in the opposite orientation without tipping over any cones. “These events are designed to show an operator’s ability to perform more than one function at a time while maintaining control,” said Jim Headley, president of Crane Institute of America, Sanford, Fla. Headley is also an authorized CIC Practical Examiner and served as a judge at several of the Regional Rodeo Qualifiers.